Anchor has a range of rented sheltered housing locations around the country that have on-site home care services for tenants that need additional care or support but are still able to live independently. This type of housing with care is sometimes known as sheltered housing or extra care accommodation. The care and support services at these sheltered housing locations are either delivered by Anchor or a reputable local third-party care provider and care packages are arranged through the relevant local authority based on their specific selection criteria. 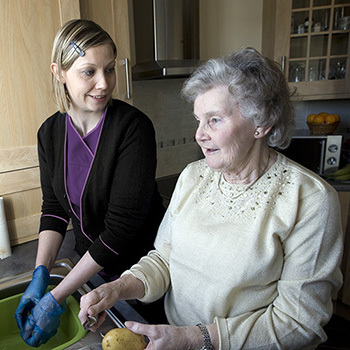 The support available and the charges for these care services will vary depending on the location and the level of support required by tenants. Each Anchor rented sheltered housing accommodation location is also supported by an experienced manager who takes care of building maintenance and gardening. They also offer a helping hand if you require an urgent repair, in an emergency, or have any questions about bill paying, security or personal support. As with all our properties, Anchor’s rented sheltered housing is linked to our 24-hour emergency call system, Anchorcall. Anchorcall is monitored 24hrs a day by our friendly, well trained staff, ensuring help is always on hand should you need it. We have sheltered housing available to rent across the country.